ROUND REVIEW 2: EHF EURO 2018 Qualification Group 1 ends with expected wins for the favourites, as everything was decided prior to Round 6. After EHF EURO 2016 finalists Germany and Spain finished qualification for the 2018 event with a clean record of six wins, Denmark became the third unbeaten team on Sunday evening. The 2008 and 2012 EURO winners beat Latvia in their last qualification match in a more than comprehensive way to finish on 11 points. Hungary were the only team to take a point against the Danes during the qualification phase – and they provided their outgoing coach Xavier Sabate with a victorious farewell against the Netherlands. All positions in this group – Denmark ahead of Hungary, Netherlands then Latvia – were confirmed before the final round. Like in his last match as the coach of Telekom Veszprém, Sabate was gifted with a farewell victory by the Hungarian national team. At the VELUX EHF FINAL4 2017, his club beat Barcelona in the three/four placement match, and now his national squad finished EHF EURO Qualification with a win against the Netherlands. In both teams, Sabate will be replaced by Swede Ljubomir Vranjes, who arrives from SG Flensburg-Handewitt. Though the match had little significance with regard to the final tournament in Croatia, Hungary were out to remain unbeaten on home ground after defeating Latvia and recording a draw against Denmark. The 2:1 in minute six was the last Dutch advantage, and Hungary were constantly ahead by three to five goals until the break. In contrast to the first leg – a close 28:27 match – this time the Sabate’s side were dominant. With Bence Banhidi (six goals) and Matyas Györi (10 goals) on fire, Hungary decided the match with their first seven-goal lead at 25:18. Though the visitors managed to reduce the gap, the Hungarian win was never endangered. Bobby Schagen and Arjan Haenen were the top scorers for the visitors with six each. With nearly all court players and even goalkeeper Jannick Green on the scorer list, Denmark showed their all-around strength against a chanceless Latvian side, who finish qualification without a point. After the 4:0 and 12:4, the deal was already sealed for the hosts, while Latvia (without their tall shooter Dainis Kristopans) needed 45 minutes to score their 10th goal. Unfortunately for them, Denmark already had 23 in their account at that time. 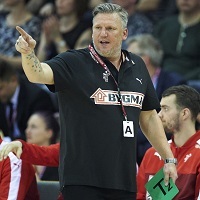 Coach Nikolaj Jacobsen used his full rotation and gave playing time to some younger players – but the dominance did not come to an end. The Danish series of not losing any home match in EURO Qualifications since the start in 1993 continued without any danger. The top scorers were Martin Larsen (Denmark) and Toms Lielais (Latvia) with six goals each.